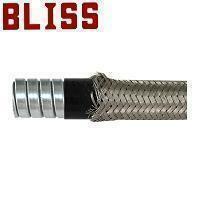 Flexible Wire Braiding Liquid Tight Conduit(A9533) - Bliss Yih Enterprise Co., Ltd. Enhanced structure offers stonger safety in hazardous area. A2067 (galvanized steel core with PVC coating) with outer braiding. Liquid-tight and high tension resistant.